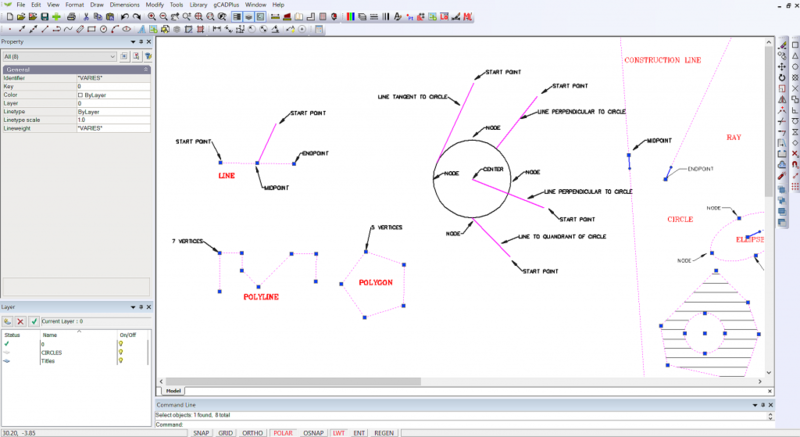 Every entity placed in a gCADPlus landscape drawing has a number of defined snap points. For example, it is easy to jump to the mid or end point of a line, the center of a circle or the center of an arc. These points are indicated by ‘handles’ or ‘grips’ that vary according to the type of entity. The figure below that shows many of the ‘primitive’ entities in gCADPlus and their respective handles (or grips). Entity snaps enable quick selection of exact points on existing entities without needing to know the exact coordinates of those points. You start a command – for example the LINE command, and select a start point(say) the end, then locate a destination point on a line, arc, the center point of a circle, the intersection of any two entities. The location does not even have to be an entity. Entity snaps can be used to draw entities that are tangential or perpendicular to existing entities. efficient method when asked for a ‘to point’ is to simply right click and choose ‘snap overrides’. It is not immediately obvious, but the grips osnap option allows snapping to each of the four quadrants of a circle (or part of a circle – an arc). this case, set a running osnap. The Drafting Settings dialog box – the osnap tab – can be used for that purpose. To activate it, right click in the drawing editor and select drafting settings and the osnap tab. To set a running osnap, select the first tick box – “Object snap on“, then select the required osnap – end, int, node etc. The F3 function key is a toggle for switching running osnaps on or off. Tip: Try and minimize the number of option boxes you tick. If you run with a lot of snap options on at the same time, the software will spend far too much time hunting for handles on elements in the drawing. This is particularly a problem in crowded areas of the drawing. You may well find that the to point is not where you expect it to be, simply because the software has jumped to a handle that you did not see.